Fantagraphics Books President and Co-Publisher Gary Groth announced today at Comic-Con International that it has entered into a publishing agreement with William M. Gaines Agent, Inc. to publish the EC Comics Library, beginning in Summer 2012. The announcement teams two of the most storied comics publishers in history and aims to reintroduce the timeless work of EC to contemporary readers. Fantagraphics will re-package the EC Comics (with the exception of MAD, which is now owned by DC Comics/Time Warner) in a series of handsome hardcovers devoted to specific artists and writers. While virtually all previous EC collections have been published by comic book title, Fantagraphics will collect the comics by artist, allowing fans to finally own single-volume tomes collecting the work of their favorite creators. Entertaining Comics may have been the greatest mainstream publisher in comics history, with an attention to quality and consistency that has never been rivaled. Under the stewardship of William Gaines (who took over the company from his father, Max Gaines, in 1947), EC’s “New Trend” line employed a Murderer’s Row of writers and artists including Harvey Kurtzman, Wally Wood, Jack Davis, Johnny Craig, Al Feldstein, Reed Crandall, Will Elder, Frank Frazetta, Graham Ingels, Jack Kamen, Bernard Krigstein, John Severin, Al Williamson, Joe Orlando, and many others. Like most of its contemporaries, EC specialized in genre fiction, specifically horror, crime, science-fiction, war, and satire, with several titles that seeped into the public consciousness long after their demise, including Tales from the Crypt, Two-Fisted Tales, Weird Science, and of course MAD. Unlike most of its contemporaries, Gaines and his staff took great pride in crafting socially aware works that transcended their genres. “At a time when comics were consid- ered sub-literate junk by the reading public, Gaines and the EC creators were impressing people like Ray Bradbury with the aesthetic possibilities of the medium. That was no mean feat,” Groth added. • “Corpse on the Imjin” and Other Stories by Harvey Kurtzman. This will reprint all the war stories Kurtzman wrote and drew himself in Two-Fisted Tales and Frontline Combat, including all 23 of his covers — each a masterpiece in its own right. This volume will also include all the war stories that Kurtzman wrote and laid out but were drawn by artists who weren’t regularly featured in his war books: Gene Colan, Joe Kubert, Alex Toth, Dave Berg, Ric Estrada, Russ Heath, and others. (The regulars were Jack Davis, John Severin, Wally Wood, and George Evans, each of whom will later be the subject of their own war comics collections). Kurtzman’s war comics are still considered to be the gold standard for the genre, with a devotion not only to historical accuracy but also to resisting any impulse to glamorize wartime; a WWII veteran himself, Kurtzman’s humanistic approach was in stark contrast to the simp- leminded, jingoistic efforts of EC’s rival publishers, and paved the way for other popular media to depict the true face of war. 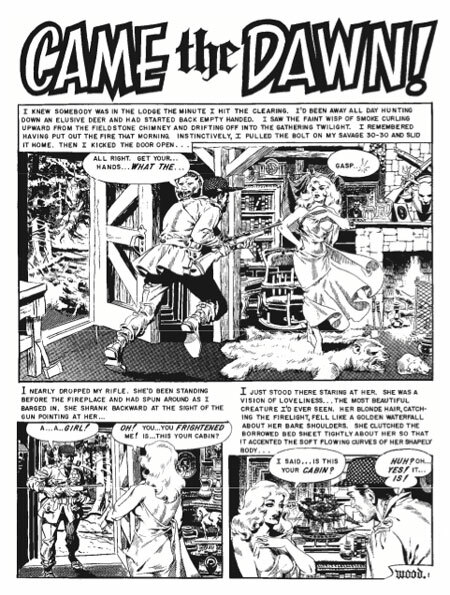 • “Came the Dawn” and Other Stories by Wally Wood: Though often remembered for his science-fiction work, Wood’s heavy, noirish brushstrokes were perfectly suited for EC’s rough-hewn suspense stories in (the appropriately titled) Shock SuspenStories and this volume will collect them all for the first time. • Jack Davis’s horror stories (exact title t.b.a. ): Jack Davis’s gift for caricature has made him an icon in the advertis- ing world and helped define MAD magazine, but he was also one of the most versatile cartoonists of his generation; after “Ghastly” Graham Ingels, Davis was EC’s most prolific horror artist, appearing in all three of EC’s horror titles — Haunt of Fear, Vault of Horror, and Crypt of Terror. This will collect the entirety of Davis’s horror work, all of which was written by Al Feldstein. • Al Williamson’s science-fiction stories (exact title t.b.a. ): EC published two SF comics — Weird Fantasy and Weird Science — and Williamson was one of the stars, with an illustrative style that carried on the tradition of the great adventure comic strips like Alex Raymond’s Flash Gordon. This volume will compile all 174 pages of Williamson’s SF stories. Fantagraphics will be publishing four EC collections a year, beginning in Summer 2012. By: Wally Wood, Al Feldstein, et al. 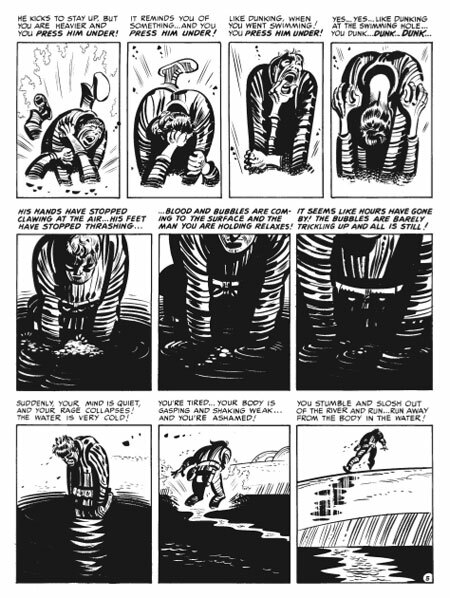 By: Harvey Kurtzman et al. EC comics are some the the best stories out there. I don’t see a page count or price for these book.